Rascal was a “Cockapoo,” a cross between a Cocker Spaniel and a Poodle. He stayed active by chasing sticks, running by the river, chasing balls, swimming in the river and chasing toys. 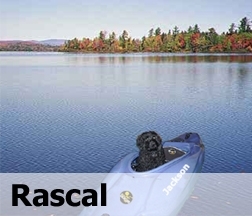 Rascal had almost 200 days of canoe tripping, sea kayaking and SUP’ing under his collar. He secretly loved cats, but was afraid of them? When Rascal was not working in the store, on the river or running to/from cats, he liked to relax in front of the keyboard and play requests. You can see him playing “Happy Birthday” in the video below (His care-givers seemed to have a lot of spare time? ).